Campus climate issues continue to pervade many institutions, with related news stories commanding headlines across the country. Through oversight and leadership, college and university governing boards play an important role in helping to create inclusive campuses. 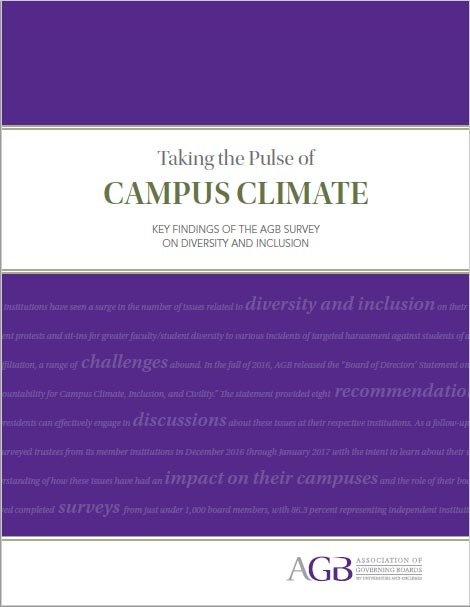 AGB conducted a survey of nearly 1,000 board members to take the pulse of campus climate-related issues, measure their understanding, and gather their views about their boards’ engagement with this topic. The downloadable full report highlights some of the key findings from this survey.